To find out where this condition gets its name, we need to look at a specific area of the foot. Your foot is made up of bones, muscles, tendons, and ligaments. The plantar fascia is a relatively inflexible, strong, fibrous band on the bottom of the foot that supports the arch of your foot. Beginning at the heel bone, the plantar fascia extends the length of your foot to connect with your toes at the ball of the foot. When you walk, your weight is distributed across your feet. Any imbalances in the mechanics of your foot and distribution of weight can potentially cause pain. 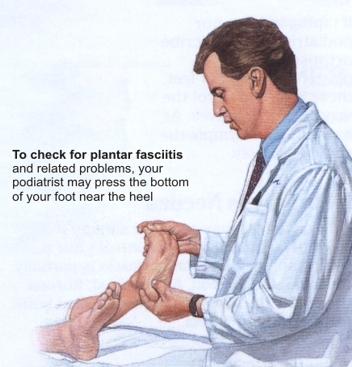 Diseases involving inflammation end with “itis.” This explains the name of the condition as being an inflammation of the plantar fascia, thus plantar fasciitis. Repetitive movements such as walking or running stretch the plantar fascia. Because it is not very flexible, this can cause small tears in the fascia, which leads to inflammation and pain. Other factors such as high arches, fallen arches, or a change in the walking surface contribute to the stress placed on the plantar fascia and heel.